With graphic design experience spanning almost 15 years, a Tier10 designer muses on the lifespan of an automotive print ad. Kind of stumped, eh? Now, think of the last automotive TV spot you saw. A little easier, right? I mean, come on, it’s a car. How the heck are you supposed to sell a car with a photo when you can spend 30 seconds on TV having some tall, dark and handsome guy beating the living hell out of a 5-series while a camera swiftly pans around the cabin showing off rare, double-stitched leather seats, then zooms out to show the car drift an S-turn with ease and finally fades to black and fades that blue and white logo in? A print ad is tougher. If you’re lucky, you have a suitcase of photos that a team of photographers took either in a studio or possibly on top of a hill with the Pacific Coast Highway in the background right at the magic hour. Then, those photos went off to someone like me, probably in a dark office, dimly lit by a 27″ color-corrected studio monitor to then spend countless hours retouching those photos so everything is beyond perfect. So perfect that if given a million dollars, you’d never be able to reproduce a car that perfect. Reflections are removed and then better ones added back in. Angles are changed so you can see that perfect combo of the front clip, wheels and vehicle midline. The cabin is darkened as to not distract from the outer shell. Chrome becomes flawless. Headlight glass becomes transparent. Then you have a choice. Do you show off this vehicle on seamless black or white and have the car speak for itself or do you take it and put it in front of some obscure Frank Gehry-esque building that accentuates the vehicle by adding an appealing backdrop right to the point of becoming distracting and then pulling it back just a touch? Ok, great, we have a photo to use. Then comes an equally tricky part. Heck, this part is almost—if not more—important than the photo. Copy. Do you go short and sweet or do you sell the car a little more? Is this going to be an abstract ad where the Creative Director is going for a Gold Pencil award or is it being mandated by the OEM to sell sell sell? The former is what fills portfolios, the latter, well, not so much. I want to touch on the “smart” and creative ad first. These are every designer’s dream because there is usually one line of copy and that copy is simply brilliant. It was penned by a copywriter after two days of pure suffering. It happened after four whiteboards were filled up and erased. It probably happened in the shower, but trust me, this is the kind of line that when you see it all come together in print and you read it, you get goose bumps, look around to show the other designers around you, and say “Damn, that’s GREAT.” This is the type of ad that wins awards and the copywriter is the NBA All Star that brings it to the agency award shelf. The best part is that the ad literally designs itself. 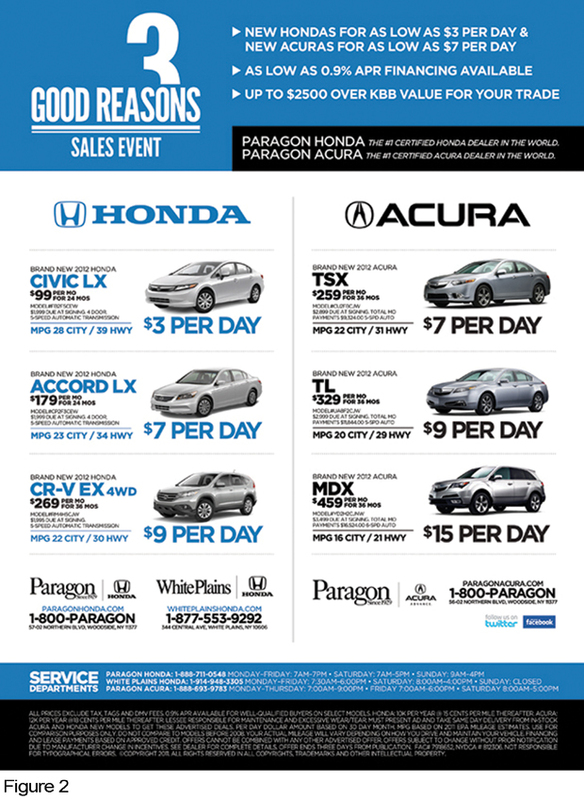 Nine-tenths of the page gets the photo, then you add the perfectly kerned type in just the right position, make sure it’s at just the right point size, and finally slap the OEM logo and tagline in the top left or bottom right. Done. Award city. Now onto the “selling” ad. This one’s tough. It’s just like the “smart” ad, but instead of a line of 8pt copy, you have to somehow fit a photo of a car (or six, eek! ), some sort of campaign logo that is announcing to the world that yes, you too can now buy this car at no money down, or at 0.9% APR, or there’s a holiday soon so *insert holiday here* sales event and come on down. Each car will have to give the gory details of the sale and how much you’ll pay a month, the dozen or so niceties the car has for you built right in and then that asterisk. Oof. That’s for the two paragraphs of legal that gets buried down at the bottom in 4pt at a -45 kern and 4pt leading. You’ll never read it but it’s there for that one guy who does and it’s needed on every sales ad. I know I’ve painted a grim picture of the selling ad so I’ll try to stand up for it a bit here. It gets a bad rap because out of all the sales ads, 99.999% are utter crap. 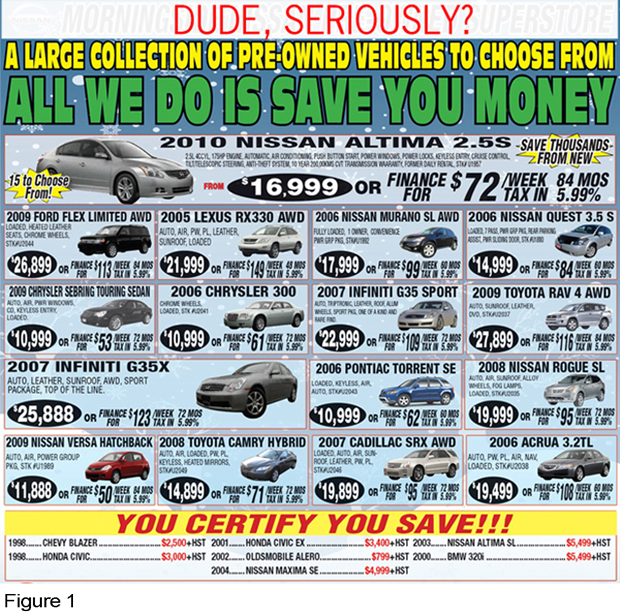 Those are the ones with 119 cars crammed in on a full-page Times ad in black and white literally screaming at you to come in and buy a car or the world will end (See Fig. 1). They’re made by designers who hate their jobs, I imagine, because when I look at them, I’m glad I don’t make those ads. I am proud to say that I am of the .0001%. I am a classically trained artist, as are all of my peers in the room who all take this sort of work very seriously. At the end of the day it’s a car ad sure, but we know what works and we know what doesn’t. There’s a lot that goes into a smart “selling” ad. A tight, crisp and ultimately smart event logo. The vehicles are displayed in a pleasing way, usually stacked with enough breathing room to give them their own presence on the page. The copy and selling points for each car are presented in a manner that is exciting. By that, I mean, the main message (total price, APR, per month price, etc) is big and bold but not overpowering (See Fig. 2). Lesser copy is smaller and in a thinner font yet still readable. The kerning is tight as is the leading so it all becomes a “block” of information on the page keeping negative space in check the entire time. Pleasing colors are used, avoiding reds and yellows because not only do they not print well, they turn away a potential sale. Margins are nice and tasty so nothing is too close to the edge and everything is spaced out evenly—both mathematically and visually as well. Logos are small yet still readable. Social icons and URLS (and even QR codes) are added where space allows, to maximize the ad’s “salability”. If you can get the buyer to a website while looking at a print ad, that is all the better because it gets them to learn more about the wares you are trying to sell in a limited space. Now you have them on an entire website to browse. It’s all in the details and how everything falls together properly. It’s not a glamorous job, but for a car guy such as myself (and many more who sit around me), getting to work with photos of your dream cars every day is a gift. I think that once a layman can understand what goes into producing these ads, he/she can better appreciate what, and most importantly how, it’s being sold to them. Error - Error validating access token: Session has expired on Tuesday, 06-Feb-18 09:00:00 PST. The current time is Thursday, 25-Apr-19 12:51:13 PDT.